Once again, I had vacation days to take at year’s end. My wife and I had already done our share of driving to relative’s homes for the holidays, but our daughter was stuck at home in southern Missouri, and wanted to visit her grandparents in Kansas. 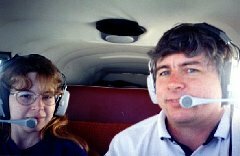 It was my chance to get in a bit of flying - if the winter weather would cooperate. On the morning of Becca’s birthday, the weather looked good, though somewhat windy and I set out to pick her up for the visit. Arriving at the airport, I removed my aircraft battery, the one that would not hold a charge, and connected it to the car with jumper cables to charge. Just then, the airport mechanic drove up and said he had the battery that I had talked to him about purchasing, on a charger, and went to get it. I took this as a sign that this would be a great day. As I took off and headed south, I found I had a tailwind of 60 knots. Wow! For the first time ever, my GPS showed my old Tri-Pacer with a ground speed of 185 mph, with one burst to 199! I was enjoying this to the fullest, but as soon as I landed, it occurred to me that there is no free lunch. We were now going to head northwest and it was payback time. I planned a fuel stop in southeast Kansas, hoping it would be my last before returning to Missouri. We took off into the rocking, rolling wind and began our trek. I remembered Becca’s bouts with airsickness as a child, and hoped she had truly outgrown it. I didn’t mention it - I always felt talking about it made it more likely. Up higher, it was not really a rough flight, just some waves with an occasional sudden jerk, which would bring a concerned glance from my passenger. Now the full effect of the wind was becoming apparent. Ground speeds barely over 70 mph were telling us this was going to be a long trip. Thirty miles, and nearly as many minutes away from our fuel stop, I switched the radio to the ASOS frequency and found the wind to be from 310 degrees at 29 knots, gusting to 42! This was worse than I had anticipated, but my nearly current chart and my GPS database agreed our destination had a runway 31 that was aligned perfectly into the wind. I switched to Unicom and soon heard a Cessna pilot announcing his intention to land on runway 35. He seemed unconcerned about the crosswind. I wondered what type Cessna he was flying. Minutes later he was calling Unicom asking about runway 31 - Said the wind was just to strong to land on 35. Unicom responded that 31 was closed and very rough, especially at the approach end. He could land on 31, but only at his own risk. As the Cessna pilot did a low pass to inspect runway 31, I began to think about that statement. My Tripacer, with its big tires, has landed on some incredibly rough runways of dirt, gravel, and crumbling asphalt. Landing directly into a strong wind on a recently abandoned runway, with probably only a 2 or 3 hundred foot roll out, seemed much less risky to me than trying to land with a 29 to 42 knot gale attacking me from the side. Exactly what risk did "they" assume if I landed on runway 35 instead? My daughter and I were the ones in the plane! Obviously, standing there in the FBO, the man on the radio had no actual risk - no matter where we landed. He was referring to paper risk, assigned risk, lawyer created risk, government created risk, every kind of risk except the actual risk we were subject to. I wondered how many times a new or even older pilot has been tricked into taking a real risk because someone told him that to do otherwise, he was taking a legally defined risk. And I realized why the pilot-in-command must always be given the final authority when it comes to safety. After an extremely rough final approach, we too landed on closed runway 31, without incident - and with very little risk. The runway was much smoother than the air above it. I remembered that it was important to stay vigilant until coming to a complete stop. The taxi to the ramp was surrealistic, with the plane often feeling like it was floating with the strong gusts. We parked on the opposite side of the gas pumps from the Cessna Skyhawk. Then from inside the FBO we watched the two aircraft dance in the wind as the operator fueled them. The Cessna pilot was on the phone waiting for someone to answer and asked if we were still shaking. I nonchalantly told him that a moment or two of the approach had been a little scary. I could be brave now! We managed to proceed to our destination that day, though I had a definite plan B and plan C in mind. It was a 4 1/2 hour trip that takes 2 hours on a windless day. Becca got to make her visits and the next night we returned to Missouri on a quick night flight with much more favorable winds. It was a lovely, smooth New Year’s Eve with dozens of glittering, shimmering towns and cities visible for a hundred miles in every direction. Once again, I was reminded that the good flying far outweighs the bad. “Carelessness and overconfidence are more dangerous than deliberately accepted risk”.